Oh. My. God. Where do I even begin with this book? It absolutely surpassed my expectations and blew me away. If the colourful cover doesn't draw you in, the premise for the novel better. I'm all for strong female leads. I love them more than I can describe. They're kickass and don't over analyze petty things likes their appearance. Like Katniss, Lynn is a strong and tough character. She's killed people to protect her water source and basically her life and isn't afraid to do it again. Her character growth throughout the book is something you'd have to read for yourself it's so good, too. It's also believable. Being someone who hasn't interacted with anyone else but her mother, she's weary of others and I'm glad to see that carry throughout the book, even though she does change significantly by the end of the book. So there isn't anything fluffy about this book, either. It's gritty and dark and sepulchral and dangerous. There is no point when Lynn is completely safe, even if she is hunkered down in her basement. This book went down a plot that I wasn't expecting, but I still loved it. I've always wanted to read a dystopian where it truly had a dark and gritty feel to it. You get it occasionally, like in The Immortal Rules by Julie Kagawa, but it's not very often where the mood is convincing to the story. Also, I've always kind of had a tiff with these kind of dystopian books where the main character practically ends up finding their soul mate. I personally don't think out of the very little humans left on earth that you are going to find your lover for life on a whim when society is crumbling and there are little to none people you can trust. So I liked how there wasn't really any romance in this book--loved it, really. Don't get me wrong; I love my romance. But when something like that seems uncharacteristic of the character or unnecessary or unbelievable to the plot, I don't see a reason for it. I whizzed through this book in less than a day. I just couldn't put it down. I think that this book definitely places as one of my favorite books of the year and I don't even like dystopians as much as other people seem to. Just not that crazy over it. I would definitely recommend this to both non-dystopian and dystopian readers alike. 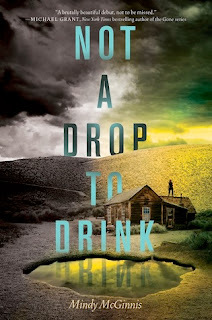 Circling mainly around the main character Lynn, Not a Drop to Drink is a great tale about love, sacrifice, death, loyalty, and survival. My review of this one posted today, too. Sadly, we had completely different opinions on it!! I wasn't a huge fan. But that's why I love blogging!!! It's great to see different opinions--always makes me want to read a book, despite negative reviews! I've never heard of this one and will have to check it out now. I haven't been feeling the dystopian YA's lately--they all start to run together in my brain after awhile (Divergent, Delirium, Matched, Enclave, etc.). This one sounds like a stand out though! Great review.